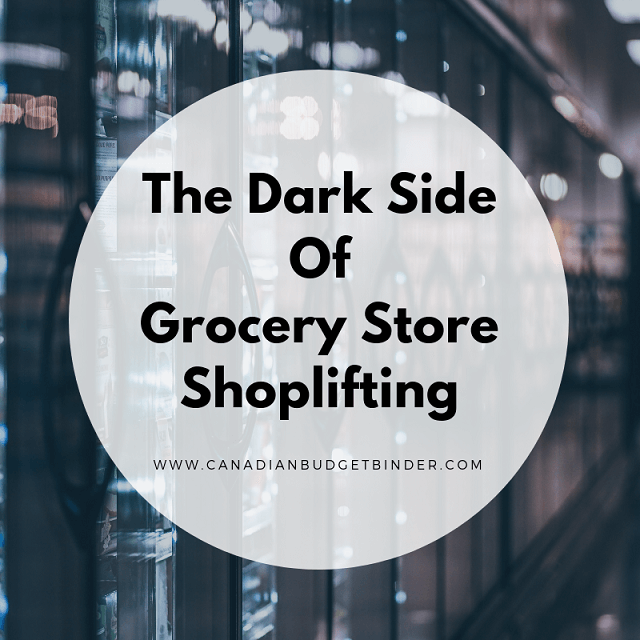 From self-check out shoplifting, retail shoplifting to grocery store shoplifting it’s a big business that costs Canadians big bucks because it’s coming out of your pockets. That’s right you pay the price as a consumer because when the store loses so does the paying customers. Today I want to specifically focus on grocery store shoplifting during operating hours because it happens far more than you think. You might ask yourself why on earth would anyone want to shoplift at the grocery store? Many reasons which I will discuss below but the main reason is money. Often it’s just not one person who is involved with grocery store shoplifting it can be an organized family event so there is much to be aware of but if you’re just there to shop you may never see a thing. You’ve seen it, I’ve seen it, everyone has seen opened packages just laying around shelves, on the floor or tossed in a bunker and the product missing. Where do you think that product went? Out the door or into someone’s belly that’s where. You might have heard that the best place to be a shoplifter is the grocery store because if you get caught shoplifting at least you have an excuse that makes more sense than someone stealing a car. Fair enough, but that doesn’t mean you will be let off the hook that easy. Being hungry is no laughing matter although in Canada there are so many resources available to those who are hungry that often grocery store shoplifting goes beyond personal consumption. It means that there is a big market in buying stolen products whether it’s electronics, furniture, clothing and yes, even food. Although I believe that grocery store shoplifting happens more for resale I do believe that it happens because someone wants something that they can’t get somewhere else. You may be able to get free food at the food bank but you might not get the products you want. Every person is different and every theft has a meaning but only the thief really knows that reason. On the streets good food means big bucks especially when the seller obtained it for nothing. There is never an excuse to shoplift but the reality is that it happens every.single.day all around the world. For some though, theft is more about the thrill than it is about the need. You have the right to remain silent!- Remember that if you are caught shoplifting. Can you get in trouble for shoplifting even if it is your first offense shoplifting? YES and the last thing you want are theft charges under your name especially when you are looking for employment. Breaking the law can follow you for a LONG time and even if you think you got off you may have more problems to sweep up down the path. Even if you get a shoplifting fine from the judge you may still have it on your police record and to food theft is not something that should ever happen especially with so many organizations offering free food to those in need. Small theft charges can be classified as theft under $5000 and anything from a small fine to a big fine depending on how many times you’ve been caught stealing. It may be the last straw before the judge throws you in jail because you have a long list of things you’ve done on your police record. No one can give you a definite answer, not even your lawyer but what is certain is that it’s not right. How does the law distinguish between theft under $5,000 and theft over $5,000? The difference is the way in which the crown prosecutor handles the charge. In the case of theft under $5,000, the crown prosecutor can decide to handle the charge as either a Summary Offence or as anIndictable Offence. Of the two, indictable offences are the more serious and the court procedures are more complicated. If a person is convicted of an indictable offence, the penalties can be more severe. What are the penalties if my daughter were convicted of theft as a summary offence? A person convicted of theft under $5,000 as a summary offence can be fined up to $2,000 or imprisoned for up to six months or both. These are maximum penalties, however, and the penalties for a first offender would likely be much less severe. As well, other options are available to your daughter as a Young Offender. With the rise in self-scanners at many big retailers the rise in grocery store shoplifting via the do-it-yourself checkout method is big. Whether it be typing in the wrong product code or simply forgetting to ring something in when the self-checkout staff member isn’t looking is very common. It’s a busy area and those who are grocery store shoplifting will take advantage of that. Imagine your city has a big parade and almost all the police officers are in the parade with few left on the streets for that couple of hours. That is the time burglars will swoop in and do their thing. The same goes at any grocery store, when no one is around or there are limited staff if the shop is busy or it’s late at night these thefts will happen often. Professional shoplifters have been doing it for years and they know how to get what they want without the eyes above and below catching them. These are the very people who are a part of product price increases because when they steal they are stealing from everyone, even you the consumer because you end up paying in the end. I’m sure there are many other methods I’m not thought of above but you get the point and it’s not just the poor who are doing this. People who get caught grocery store shoplifting come from all social classes and groups. Sometimes it happens for other reasons that are beyond the scope of the thrill or resale where doctors need to get involved in the process but often even if charges are dropped the person is banned from the store or given a suspension for a year. These days grocery stores are taking theft very seriously especially retailers that offer more than just food like Costco and Wal-Mart where you can buy everything and anything. First and foremost prevention starts with educating staff on what to look for when it comes to customers who are shopping to steal. Walking out of Wal-Mart the other day I noticed what seems to be grocery cart strips outside the store. So, if you were to rush out with your cart like a maniac trying to steal your cart would go flying or tip side-ways if you hit the strip hard. I could be wrong but it sure as heck seemed like a reasonable explanation for what I saw on the ground. You can’t even enter or exit Costco without greeting a staff member and producing your Costco membership card and then your receipt upon leaving the building. Your entire shopping cart is looked over and checked against your receipt. This is theft prevention by the store because grocery store shoplifting in bulk is an even bigger business than the small stuff at the local supermarket. Perhaps you’ve noticed that certain products are not in packages because you only get the item once it is paid for. Other items might be kept in a display case only or on shelves behind the counter especially medicine. The pharmacy is a big area for grocery store shoplifting because drugs sell on the streets whether it’s headache pills or even cough medicines. You might even notice that at certain time of the evening the pharmacy section is locked up but the store is still open. This is to prevent theft later in the evening. Grocery store shoplifting is part of the pricing problem in Canada which means that the more that gets stolen the higher we will see prices increase. Everything is part of the problem but we are all part of the solution which means teaching our kids from a young age that stealing is a big no and that it’s never Ok. That might not deter them into adult-hood but giving them a head-start is better than saying nothing at all. Discussion: Why do you think people steal from grocery stores? What other ways are stores working to prevent theft? What other methods have you seen or heard of that thieves use when shoplifting from grocery stores? After last weeks huge haul from Zehrs we didn’t need anything this week. We may run out to grab some bananas but I will add it to next weeks shop. Happy shopping everyone! I find that this month I’m wanting either soup or slow cooker treats for supper. It’s also great to break out all the nice fall spices! OUR CURRENT TOTAL UNUSED RESERVES ARE $1,897.44. This means the 1,761.30 that we carried forward from 2017 PLUS AN ADDITIONAL $1,818.86 that we have added in 2018, LESS $1,682.72 that we have drawn out for use in 2018.